Show of hands - who got some snow yesterday? I hear that out on the East cost they didn't get "some" snow, they got a bunch of snow. And even saying "a bunch of snow" is probably an understatement as different garden bloggers are starting to shovel out and post pictures like the ones that Robin at Bumblebee posted. They got a lot of snow. Over a foot of snow. An impressive amount of snow. Snow. Here in my garden the temperatures hovered around 33 F - 34 F all day, which meant that all the "precipitation" just made everything wet, but not terribly icy or dangerous. That's a good thing when one is out and about running errands and shopping and taking pictures of plants that are still green in the garden. 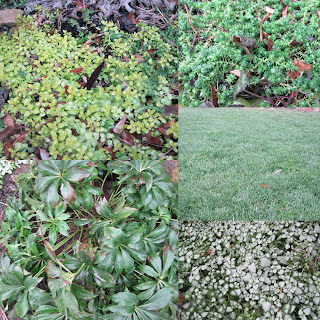 Pictured above from the top left we have a variety of Veronica repens, a sedum, the lawn, silver Lamium, and Helleborus sp. The first four are ground covers, which generally do stay green longer, providing a break from the brown and tans of mulch. I love ground covers in the garden, but sometimes as a gardener I hate ground cover in the garden. Ground cover can be tricky. Ground cover can turn on you and take over an area and then look for more places to grow. Ground cover can sulk and just look like little blobs going nowhere if it isn't happy with where you planted it. Ground cover can make it hard to add plants to an area, if it has a firmly rooted there. I once had a long, difficult break up with the ground cover English Ivy, Hedera nelix 'Thorndale'. It was so cheap and easy, just four plants for one dollar, when I first planted it. But then it took over where it was and started looking to grow elsewhere, so I had to stop it. I had to kick it out of my garden. It took a few shrubs with it, but I did manage to get rid of it for the most part. Occasionally, I still see a piece of it trying to grow its way back into my life and garden, but I'm quick to pull it out and put it in the trash. My advice on ground covers for any gardener is to think about them before you plant them. Be ready to show them "tough love" - be ready to pull them out or cut them back if they grow where you don't want them to grow. And then on a winter's day when everyone else seems to have snow, and lots of it, enjoy those ground covers, for they may well be all that is green in your garden - a beautiful color in winter or anytime of year. At last NE Scotland is getting some snow - only its dark here and I can't get out to take some more photos as it accumulates. Oh I planted some vinca once and it got beyond its boundary very quickly - now it gets a very regular clip or else a big pull straight to the compost bin when it decides to go on the prowl. I agree .... greenery is so valuable at this time of year. Interestingly, part of Nova Scotia is getting clobbered, but it's just angling across the province in such a way as to miss us completely. We have a bit of snow but it's getting quite mild tonight so who knows what comes next. You'll be amused to know that I have been unsuccessful with English Ivy outdoors. I think it's the clay soil and the irregular freeze-thaw cycles that does it in because others have no problem growing it. A conspiracy, I tell you. Ivy is dreadful but cinquefoil is worse. We only had a skiff of snow. I once planted a seemingly innocent creeping Salvia known as Blue Selene. She soon showed herself to be the strumpet, shall we say, of the garden. I was not sorry to see her go.